I completely ruined dinner last night, almost severely injured myself in the process and messed up our other plans for the evening. Josh was on his way home when he called me. My wedding ring was back from being sized and he said we should go pick it up... and maybe get a Christmas tree while we were out. I was excited about doing both. I've been waiting for a couple weeks for my ring and I can't wait any longer to start decorating for Christmas! I baked this yummy dinner in the oven and when it was done I took it out and put it on top of the stove to cool off. Well what I didn't know was that I accidentally left on a burner (Can't believe I did that!)... and put the casserole dish on top of it. When I finally noticed it, I shut the burner off and looked underneath the dish and saw that it was badly burned. No biggie... only half was ruined. I walk away. Just as I turn the corner I hear the biggest POP! The ENTIRE casserole dish shattered in to a million pieces... scorching hot food and glass EVERYWHERE. Oh My Gosh! I wanted to cry. Thank goodness the boys and I weren't in there when it happened! Josh watched the boys as I took Bella outside and then while I picked up glass off the floor. He asked if he should bother getting dressed to go out. I told him not to bother.... I didn't mean it! I wanted him to say something like, "It's ok Babe, we can still go out. We can pick up some dinner while we're out!" I was in a really bad mood after all this happened. I was really looking forward to that dinner. I was also mad at myself for being so careless! I wanted him to read my mind! I'm laughing at myself now for not just saying what I wanted... Josh would have gladly continued on with our night... I don't know why I do that to both of us. I need to work on that. The rest of the night was spent with me sulking and Josh asking what was wrong. After the boys were in bed I went out alone... I had to pick up some formula and diapers for the baby. I listened to Christmas music on the way to the store and it got me out of the funk I was in. I came home and explained to Josh why I was being such a you-know-what. He just laughed at me. I love that man for being so loving and supportive. Josh - I know you can't read my mind and I promise to work on saying what I mean and meaning what I say! Love you! Stopping by from SITS! LOL, about the dinner! I have actually done something similar except it wasn't from an accident, I am just a bad cook! Awesome that you guys communicated!!! Go get a tree today! Oh man! 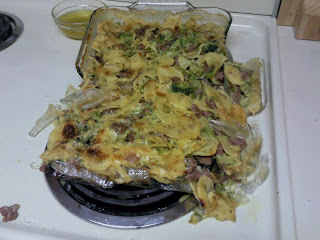 That casserole looked like it would have been super good, too! Sounds like Josh is a keeper! this has happened to me before too! it is such a loud pop!